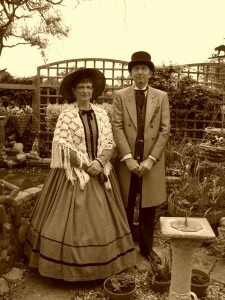 On Saturday my good lady wife and I took part in a Murder Mystery evening at Gressenhall Rural Life Museum near Dereham. What a great evening. After encountering a grisly death early on in the proceedings we then had to work out who dun it! Not so easy with all the red herrings. Still Mrs B managed to determine the culprit whilst I, along with the majority were completely wrong! And just so we entered into the spirit here is a picture of us in all out finery.